More to Camp. More to Christ. 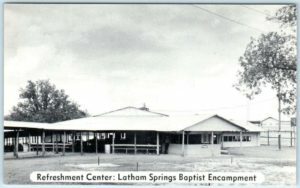 From the beginning, Latham Springs was destined to be a "place of inspiration, a place to help one resolve to follow Christ in a more devoted way". Latham Springs abides by a Statement of Faith and is operated by 12 Baptist Associations of Churches in the central Texas area. Groups from all over the world visit Latham Springs. Our primary focus of operations is to be a support organization for the local Church. Church groups can come to Latham Springs for a time of refreshing, renewal, and inspiration. Mission: To provide facilities and program opportunities to expand God’s Kingdom and disciple His people. Due to the expansion and the wider reach of its ministry, the Hill County Baptist Association transferred ownership to the 12 surrounding Baptist associations in 1964. Under the leadership of Camp Manager Charles Rodgers and enthusiastic support of member churches and associations, 11 dormitories, a new Dining Hall, Hotel and Recreation facility, and a 5-acre lake for boating and canoeing were added during the 1970s. Today there are facilities for 850 guests, cabins and hotel rooms, modern conference rooms, a 900-seat auditorium, new offices and a welcome center. Recreation opportunities include high and low ropes courses, two paintball courses, disc golf course, and a swimming pool. The waterfront offers a boating marina, swimming area, water slide and fishing. As Doctor Shoemaker dreamed, Latham Springs continues this mission of being a place of inspiration. Mike and Janet Wilson were called to Latham Springs in 2012, where Mike serves as CEO. Janet serves as Office Administrator. They have 20 years of full-time service in camp ministry, plus many more years involved in a variety of camp programs. Ty came to Latham Springs in 2014 to serve as the Operations Director. He has been faithfully serving in camp ministry since 2002. Ty met his wife, Jamie, when they worked at camp together. They have been married since 2006 with two children, Connor and Camryn. Brad has been serving in camp ministry since 2009. His desire is to help provide a place for people to come and learn about Christ. Brad is a 2015 graduate of Dallas Baptist University, with a degree in Camp Sports Ministry. Brad and his wife Shania, married in March, 2016. James and Frankie Levings have been in full time Christian camp ministry since 1995. During this time they have served at five different camps. At Latham Springs, James is Maintenance Director and Frankie is the Food Service Director. They have one daughter, Charity, son-in-law, BJ, and three grandchildren, Drew, Bailee, and Emilee. Caleb and Elizabeth Crawford met as summer staffers at Latham Springs in the summer of 2012 and began dating shortly after. They have been married since the spring of 2018 and enjoy cooking, playing board games, and spending time outdoors with their two dogs. Tiffany began serving at Latham Springs as a Summer Staffer in 2016. With a desire to serve the Lord in full-time Christian Camping, Tiffany is now serving as Housekeeping Director. She is finishing her degree in business administration.